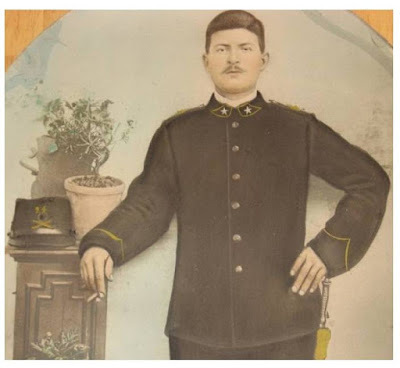 AncestorPuzzles.com: Italian Heritage-Our Nonnu Served in the Italian Military! Military conscript records are kept by birth date at the provincial government archives. 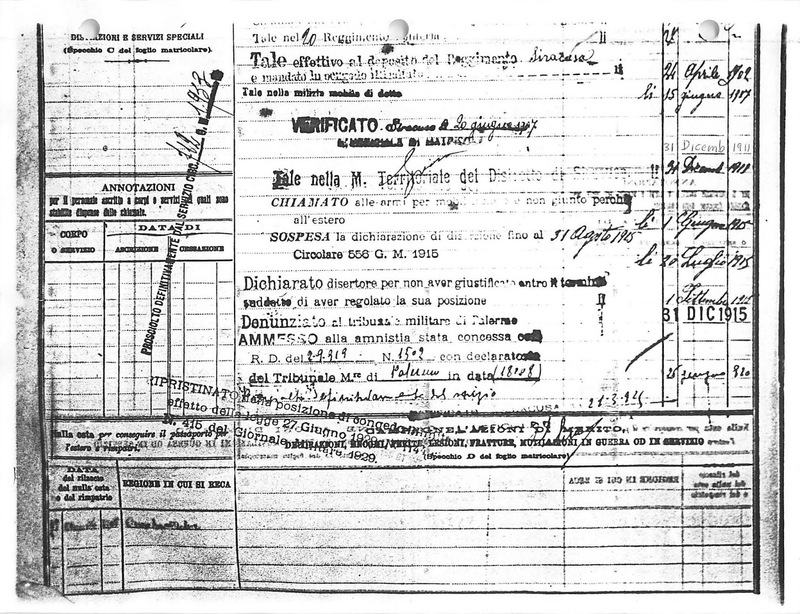 The records for Siracusa were started circa 1890 and have entries for persons born in the 1870s until the dawn of the 20th century. The LDS Church has microfilmed many of these records. I ordered the Siracusa province microfilm for my great grandfather, Antonino Cimino in 1994 at the Reno, Nevada LDS Family History Center. Today you can view microfilm online or at a Family History Center if it is a restricted microfilm. I checked the microfilm number in the Family Search catalog to see if the records had been digitized and whether they are restricted. 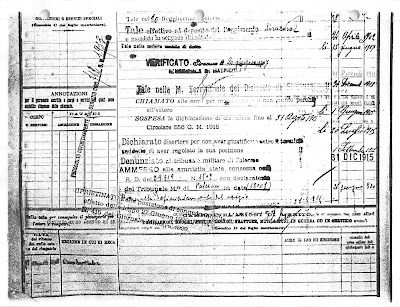 The microfilm is entitled: Ruoli matricolari per nascite 1878. This translates to Conscription class for men born in the year 1878. The microfilm number is 1642308. This film is viewable in 2018 with additional restrictions. This item is available for viewing only at your local LDS family history center or at the Family History Library in Salt Lake City. 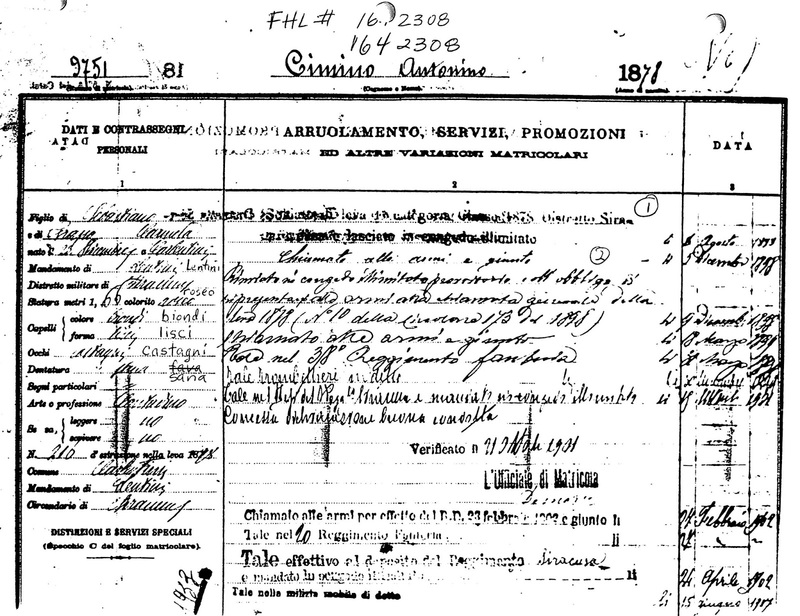 !MILITARY: 1893 Italian Army; First enrolled 6 Aug 1893. He was called to the army and he joined 5 Dec 1898. He served in the 38th Infantry Regiment. He was the bugler for his regiment. He served in that regiment until 1901. In 1902 it appears that he was assigned to the 20th Infantry Regiment. 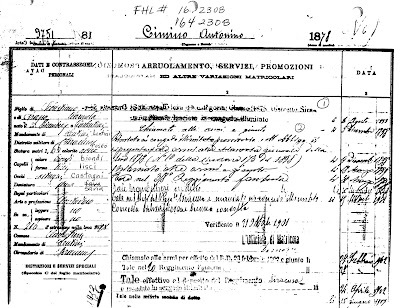 The personal description includes the following: son of Sebastiano [Cimino] and Carmela Grasso. Born 23 December 1878 in Carlentini. His height was 1.66 meters (5 ft., 5 inches). His coloring was rosy(roseo). His hair (capelli) was blond (biondi) and eyes (occhi) brown (castagni). He had a sound set of teeth (dentatura). His profession was farmer or peasant (contadino). If no records have been microfilmed for your province, a letter can be sent to the provincial archives for you. Please contact me in the contact box in the right hand column.